This week we are featuring this awesome informative graphic all about maple syrup that zerocater.com shared with us. They have a whole article that covers how and why this classic sweetener is growing in popularity, health benefits of maple syrup, and how to incorporate maple into your day. Check it out here! Cold weather equals the chance to explore flavors that just feel right in the cold weather — hot chocolate, for instance. In the past few years, one of the flavors that people really look forward to, for a variety of reasons, is pumpkin spice. But there’s something that might — just might — edge that out as it gains in popularity: maple syrup. 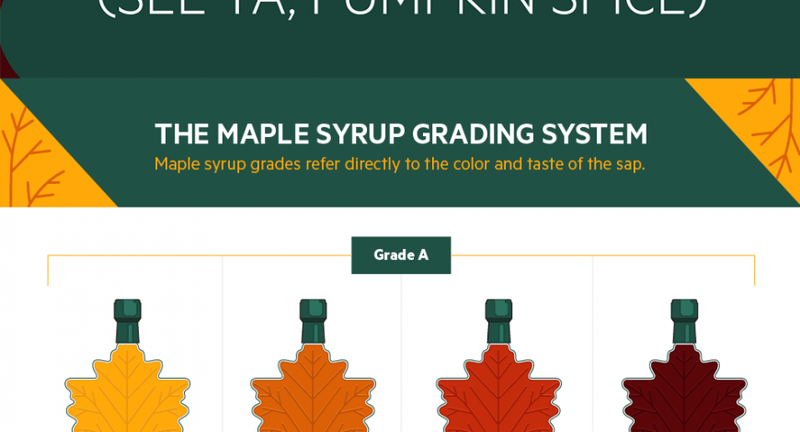 Maple syrup has a couple advantages over pumpkin spice that are worth considering. The biggest one is, of course, that it’s not cooked up in a lab. Maple syrup is 100 percent natural. And maple syrup has always had flavor variation, based on what grade of syrup is being used. For example, what was once known as Grade C is very dark and strong, and can even be used as a substitute for molasses. What else can maple syrup be used for and what flavors does it offer? This graphic outlines them.